I like Dyer, like his fiction, like his travel writing, especially like his masterful book on the Great War. But I’m less impressed, in fact profoundly unimpressed, when he starts writing about jazz. Even when he’s not writing about jazz, not directly, but referring to it tangentially as in White Sands (towards the end) you become aware of how futile it is to try and write about jazz at all. Dyer’s not alone in this, of course. Larkin achieved some memorable prose phrases in his Telegraph reviews but even he struggled when trying to capture Sydney Bechet in the medium of poetry. On the other hand maybe writing about jazz as opposed to using it to illuminate an aspect of an different subject might actually work? Dyer’s prose certainly works when he’s NOT using or referring to Coltrane or Pharaoh or Art Tatum. When he’s writing about Gauguin, at the beginning of the book, he’s at his best. And again, at the end, n the subject of a health scare, he’s at his best. 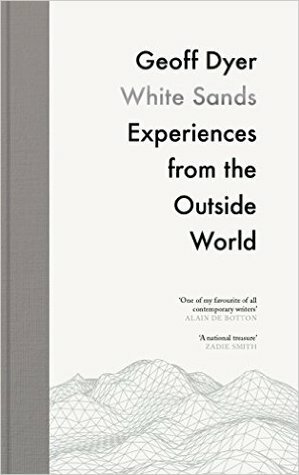 Sign into Goodreads to see if any of your friends have read White Sands.